One touch- one function, this is a rule that we tried and tested in our biosafety cabinets. 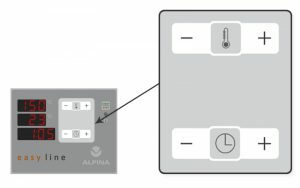 It is a base of whole idea- the most important functions such as set of temperature, work mode and time are avaliable on the main control panel in the same time. Handling of the appliance is simple and comfortable due to using unambiguously marked buttons with invariable functions and by using readable pictograms. All crucial parameters for process are displayed in the real time in three separated screens. Full control of process is provided by constant monitoring of set temperature, current temperature and remaining time of heating. The appliance may be programmed in 3 easy steps and do not take more than 10 seconds. In comparison with other ovens easy steering system allow to save time of users. In order to make handling easy we applied two levels of switch On/Off the sounds. For comfortable work we can On/Off sounds of the buttons and warning signals separately but with saving all safety requirements. Direct access and readable mark of the work mode allow to easy settings of the heating ovens. delay start – the appliance may be set for delay start. ALPINA is manufacturer that properly recognize Clients’ needs and requirements. Owing to painstaking work in R&D department we provide the best product in competitive and attractive price.